Have you ever asked yourself a question what do clients see first when they visit a website for the first time? Of course, the user interface (UI). A well-made and engaging UI doesn’t only bring aesthetic value but makes a product more trustworthy for users. It also helps to highlight the individuality of a brand and target the website to be positively accepted by a certain target audience. 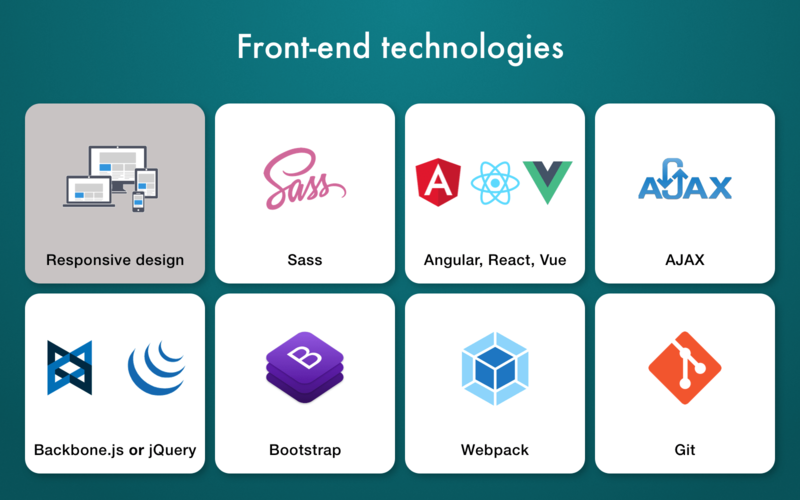 To create a high-quality UI, you should hire front-end developers. Since we’re familiar with the common pains every decision-maker is faced with when trying to hire front-end developers with decent experience, we ’ve decided to create a clear guide that could help you to deal with this question in about 15 minutes. You probably already know that developers are divided into junior, middle, and senior according to their skill level. But which one to hire to get quality final product and not to overpay? When developers are just starting out, they are often familiar with only one programming language or framework. Respectively, the range of technologies and skill level they possess allow solving a limited number of tasks. In a perfect world, junior front-end developers are capable of building a stable app that will carry out most of the functions it’s intended to. However, in reality, it turns out that juniors often need the help of their senior colleagues. Thus, they work slower to fill their knowledge gap and might be unable to make an app corresponding all of the set requirements. So think twice before you hire front-end web developer of this level. As developers gain seniority, they get a precious skill of building apps tailoring them to appropriate business logic. They’ll examine the business aims and budget limitation firstly and choose the most suitable technologies to build the product. A senior developer can also propose you several alternative ways to solve a problem and explain the benefits of choosing each one in a simple language. After years of hands-on experience, they can confidently foresee the consequences of implementing each scheme. Of course, you can’t count developers’ talent in years. Some junior developers can possess all the skills you need for a project despite a lack of experience. Still, the best way to hire front-end programmer with good skills is to find someone with a tech background to help you with interviewing candidates and defining necessary skill set. If you need any assistance with hiring skilled front-end developers or interviewing candidates — we can help you. Reach us via the contact page or live chat in the right bottom corner to ask for details. If your project is rather small (e.g. a landing page or a simple business website), the junior developer can all you need. However, as the project complexity grows and the wider range of technologies is needed, consider choosing more experienced developers. It’s important to examine front-end developer responsibilities before you start looking for candidates. In case you have no technical background and don’t really know what front-end engineer responsibilities are, I’ve listed the main of them below. Create a layout of an app using HTML and CSS to deliver a pixel-perfect design. Build the client-side of the product: user interactions, animations, responses to a server (e.g. using AJAX). Write clean code that could be easily reused in the future. Optimize applications to achieve the best performance and scalability. Collaborate with other members of a team. Simply put, a good front-end developer is a neat designer and an accurate programmer in one. It’s worth mentioning that skills of front-end developers depend on their seniority. 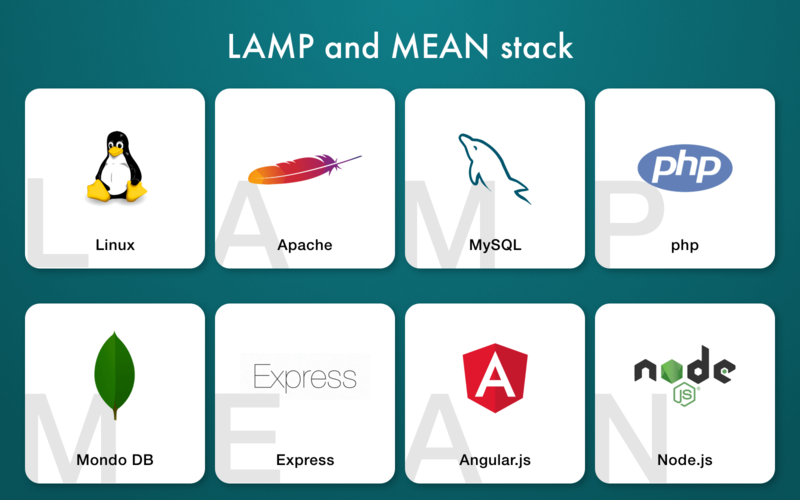 Thus, senior developers can be also skilled in back-end languages and frameworks such as Node.js, Python or PHP as well as to possess such technology stacks as the LAMP or MEAN. There are several ways to look for web development service vendors and professionals: outsourcing companies listings, freelance portals, and job boards. However, each of them has its own benefits and drawbacks. So, to maximize the former and to minimize the latter, you should know for sure which developer suits you best: freelancer, in-house employee or remote developer. Compared to other options, hiring a freelancer is the most affordable one. However, in reality, the more freelancers you hire, the more communication and other related problems appear. Not to mention the likelihood of slower development process and more bugs in the end product. An attractive benefit of choosing a freelancer is a relatively low price. It happens because the competition on freelance platforms is tough. Another benefit is that you can hire freelancer only when you need them. You don’t have to worry about sick leaves, vacations, etc. This option is great for a small-scaled project or if you don’t have a constant workload. Freelancers’ major flaw is their dependability. First of all, freelancers often live in different time zones, so it might be difficult to control their timetables. Furthermore, you have little protection from freelancers leaving your project without saying a word which is the worst nightmare for a product owner. As a decision-maker, you probably know the difference in working effectiveness between loyal and unloyal employees. In-house developers are directly interested in positive project results and are less likely to leave (unlike freelancers). By offering monthly salaries increasing with the time along with a constant and well-equipped workplace can motivate developers to care about your long-term goals and mission. There’s a higher chance they will work for longer and become well-cooperated team players. As a result, urgent tech tasks can be resolved quickly. Paying salaries to developers on a regular basis, which increase over time, is costly. Finding a good developer is difficult, especially if you’re located in a small city. Not to mention such expenses as taxes, software, hardware, office space, etc. It takes a decent amount of time to find, interview, and onboard in-house developers. What’s more, this process tends to repeat all the time since programmers tend to leave companies they’re working in more often compared to other specialists. IT outsourcing services rapidly became a popular hiring option for decision-makers. How does it work? You hire front-end developers in an offshore software development company from any country you like. And they work on your project remotely from their company’s office. This way you don’t pay for office rent, sick days/vacations, taxes, etc. You don’t have to spend extra money on the above-mentioned expenses. Besides, outsourcing allows you to change the size of your development team as the project scales. It’s important to note that outsourcing team works as a team, not a bunch of separate freelancers who have never communicated with each other before. The price is slightly higher compared to freelancers. Also, outsourced developers are often located in other countries so the time zone issue may occur. Tired of searching for qualified software developers? Drop us a line and get a front-end developer CV right off. Summing up this section, I’d like to say that, in most cases, it’s better to hire in-house developers or find a reliable software development company rather than switching between different freelancers. As practice shows, the latter choice often leads to time and money losses. We’ve prepared separate PDFs with tons of questions for a technical interview with front-end developer candidates. You’re welcome to download them and use during interviews. I’d like to note that front-end web developer interview questions included to those files are mainly focused on Angular framework. Hard skills are specific abilities every professional has to have. Questions in the PDF below are ranging from general (e.g. what is Angular) to more complicated (e.g. explanation for package.json file). 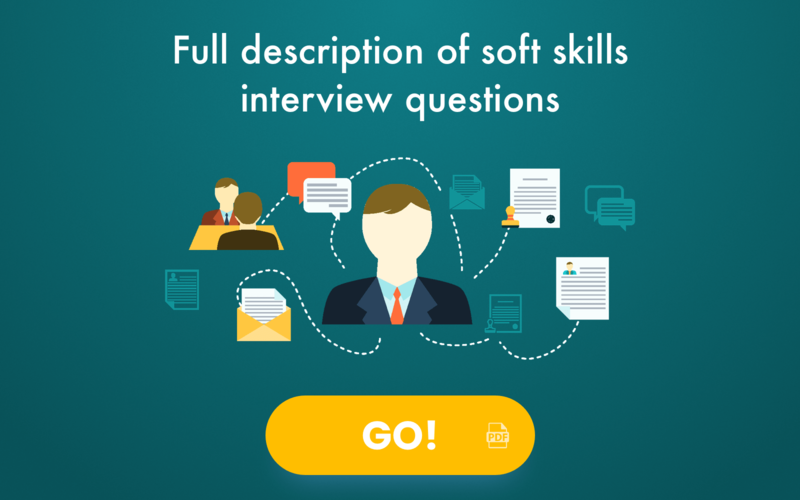 Soft skills combine communication, social, people, and other skills required to work as a part of a team. Underneath, I’ve listed some basic yet vital points you need to know before you hire front-end developers. One of the most important issues is to set clear requirements for a product. Otherwise, a misunderstanding between customer and сontractor might appear (read as time and money losses). However, making project specification is definitely not an easy task so outsourcing companies often offer their help in carrying it out. Working without a contract makes unpredicted risks closer to you. It’s better to protect yourself and add every rule to your contract that helps to regulate your working relationships better. The most important of them are time terms and money expenses. Also, you might not want to disclose your app details until it gets published in app stores. In this case, the solution for you is to sign a non-disclosure agreement (NDA). By the way, Cleveroad willingly works with NDA and offers such an option to clients. With the emergence of Agile approach in software development, it became popular to divide projects into small sprints and to receive deliverables by clearly specified deadlines. The major benefit of this approach is your capability to constantly track the progress of your project and avoid possible setbacks. However, this is a task for developers and project managers. You should just be aware of this approach to better manage the project. In 2017, Codementor.io conducted a study, in which participated 5,302 freelance developers from different countries. 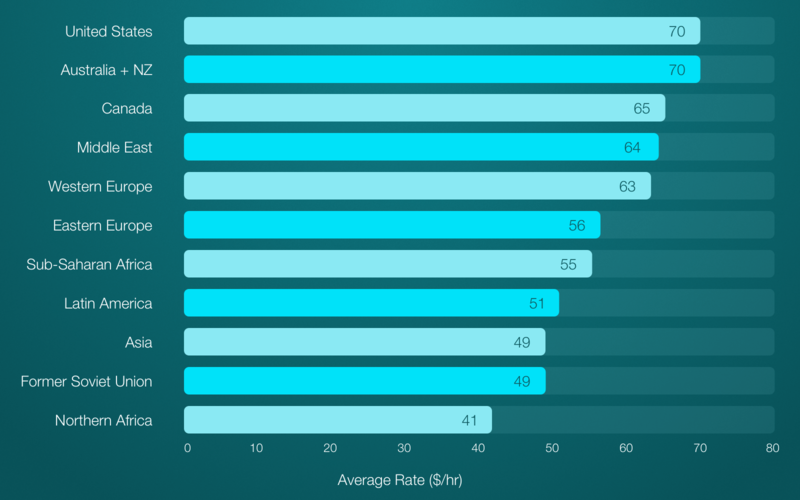 As the graph shows, the highest average developer rates are in the US and Australia. The maximum difference between these regions amounts to 40%. Below, there is a list of least expensive countries which allows to save up to 40% of costs. According to Codementor, the work of junior front-end developer amounts to $41-60/hour. Middle front-end developers basically charge $61-80, but you can save your costs and pay only $41-60 if you hire them from Eastern Europe or Africa. 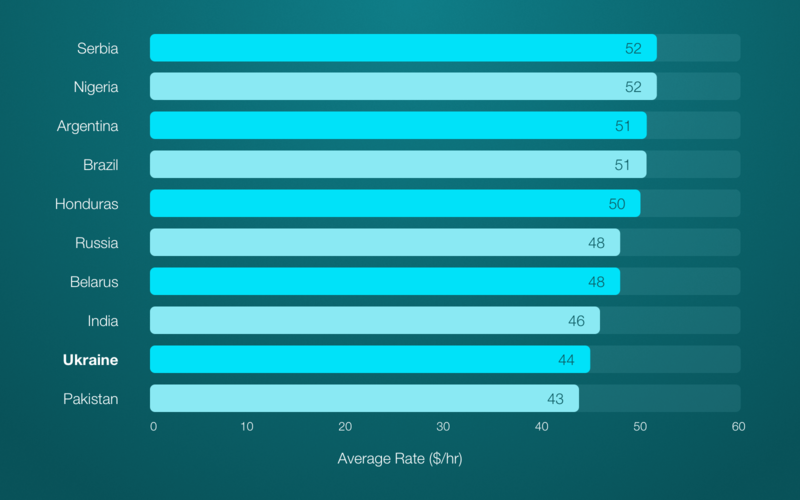 As for senior front-end developers, their hourly rate varies depending on the region that you can see in a table below. Eastern Europe remains one of the cheapest. The most expensive regions are still North America and Australia. Based on these numbers, it’s possible to calculate how much a day or a month of freelancer’s work can cost you. To do this, let’s take the average global rate of 70$/hour. Thus eight-hour workday will cost you** $560, and a month of work with a 5/2 schedule will amount to **$12,320. If you hire developers on a full-time basis to work in your office, you’re probably more interested to find out annual salary. Let’s review the average salary per year according to Payscale. Among the countries with the most expensive front-end developer services, we have the US, Israel, Australia, and Germany. And the lowest salaries are in Ukraine, South Africa, Brazil, and India. However, front-end developer salary in the United States heavily depends on a state. You can explore salaries for each state and even city on Indeed. As for global outsourcing rates, they seem to follow the same pattern. The most expensive regions are North America and Australia and the cheapest regions are Asia and Eastern Europe. We hold leading positions in different international ratings. You can check our rewards and notice that Cleveroad is a top software development company in Los Angeles, UK, and Manchester, according to Clutch.co. Our front-end developers use the latest technologies. Besides, our software engineering team follows a time-tested development patterns to eliminate mistakes, save time, and start working on the project as soon as possible. We pay great attention to the professional growth of specialists. Our developers regularly visit specialized meetups and conferences to stay up-to-date and improve skills. All developers at Cleveroad dedicate 10% of their working time on testing the functionality they currently work on. This brings plenty of benefits in the future such as preventing potential time losses because of bugs. Cleveroad uses Agile approach to manage projects. This allows us to deliver projects faster, get feedback from clients on each product iteration, and meet their requirements. So if you're interested in building your website or web app, make the first step towards and contact our managers to discuss any details concerning your product. As a bonus, you get a FREE project estimation. Before you go, you can also watch our video about the cost of IT services in Europe to choose the most cost-effective country.